Studies in a number of countries suggest that investing in health and medical research can bring positive returns (Murphy and Topel 1998, Australian Government 2004, Access Economics 2003). The benefits to stakeholders from the clinical drug trial stage of health and medical research and in particular the returns to the research organisations that carry out the drug trials are less well known. This paper reports on the preliminary results of surveys, interviews and focus groups aimed at identifying the perceptions of stakeholder groups of the costs and benefits of conducting sponsored clinical drug trials within a publicly funded New Zealand hospital. 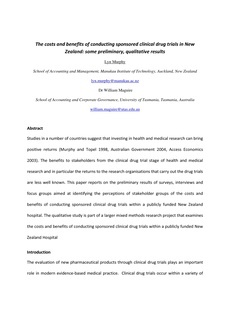 The qualitative study is part of a larger mixed methods research project that examines the costs and benefits of conducting sponsored clinical drug trials within a publicly funded New Zealand Hospital.